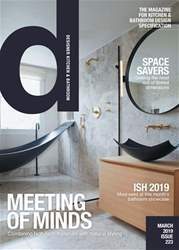 This issue of Designer features a handful of thought-provoking case studies, one involving the challenge of creating a kitchen for a multigenerational household. The aim was to make it functional but also fit for gatherings, which the designer delivered on using a bronze and white scheme. Another key case study focuses on the collaboration between sculptural designers and interior designers on a residential project that contains luxury, showpiece features throughout. Keeping up with the times, Designer has delved into the technology that is taking over the kitchen. App-controlled ovens, touch-sensitive taps and retractable cooker hoods are just some of the latest innovative pieces of tech mentioned. See the issue to find out how far technology has really come in the kitchen. Designer also looks ahead at ISH 2019; whetting your appetite for all the latest bathroom products and trends that will be showcased there. Remember to check back on the next issue when we will be covering the highlights of the event, especially if you can’t make it there yourself.